By the time students enter into 7th grade, they hopefully have a strong understanding of multiplication with whole numbers. This lesson introduces multiplication with all integers. I highly recommend spending some time on this concept before introducing multiplication with other negative rational numbers. I have successfully used this lesson with my highly supported math classes. The use of the values -13 through +13, which you will see later in this lesson, makes it obtainable for even those students that may struggle with their math facts. In preparation for this lesson, I recommend spending some time with students reviewing basic multiplication facts and the reasoning behind multiplication. It is important for students to understand that multiplication is repeating addition. Students will understand the rules for multiplying integers. Students will be able to solve two term integer multiplication problems. Pass out the Multiplying Integers Intro Packet. Guide the students through the thinking process for Activities #1-4. Here is an image of part of the packet. 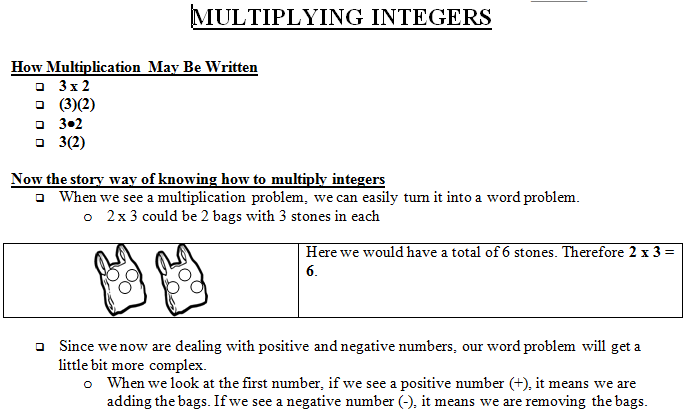 Discuss with the students that there are rules for multiplying and dividing integers. Here are a couple story lines to help the students remember. Really make them dramatic when you teach them. The married couple rules—An optimistic person (“I love life! Life is great!”) meets another optimistic person (“I love life too! The butterflies and the birds and everything are just so beautiful!”). Do you think their relationship might work out, that it might be positive? (Student response—yes.) Now imagine an extraordinarily negative person (“I hate life! Life is no good!”) meets another negative person (“I do not like life either! Let us complain about it together!”). Though they may complain about virtually everything, could their relationship still work out? Could it still be positive for them since they see the world in the same way? (Student response—yes.) Now imagine an extraordinarily positive person (“I love life! Life is great!”) meets an extraordinarily negative person (“I hate life! Life is no good!”). Do you think their relationship will work out? (Student answer—no.) No, it will be a negative thing. Consequences of one’s actions—When a good thing happens to a good person, that is good. When a good thing happens to a bad person, that is bad. When a bad thing happens to a good person, that is bad. When a bad thing happens to a bad person, that is good. 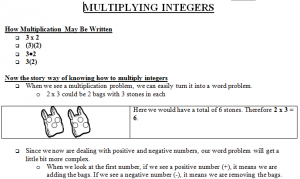 After going through one of the story lines, teach the rules of multiplying integers and then complete Activity 5 in the Multiplying Integers Packet. Stones are either cold (-) or hot (+). You can either remove (-) or add (+) stones. When you remove (-) a cold (-) stone, the temperature goes up (+). When you remove (-) a hot (+) stone, the temperature goes down (-). When you add (+) a cold (-) stone, the temperature goes down (-). When you add (+) a hot (+) stone, the temperature goes up (+). Each player gets half of the well-shuffled deck. Cards are either red (negative) or black (positive). The cards have their face value except for A = 1, J = 11, Q = 12, and K = 13. That means you have the integers from -13 to + 13 in play (except for 0). The players flip over the top card on their deck at the same time. The student with the higher valued card gets to attempt the math fact. If the player gets the math fact (sign included) correct, he/she gets both cards. If the player misses the math fact (sign included), then his/her opponent gets both cards. If both players play the same card (color and value), then a war ensues and students lay down three face down cards each and then flip for a winner (playing as described above). If you have a 3rd person acting as the “judge”, I recommend changing players after 10-15 minutes. The “judge” will then challenge the student that had the most cards (or was winning) at the time of the switch. This activity can be followed up by standard multiplication of integers homework.